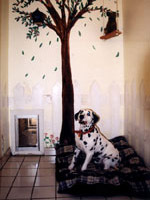 We at Woodland Park Pet Resort understand that every dog has a unique personality. 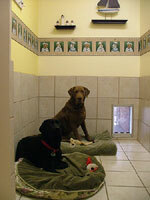 Young or old, large or small, active or sedentary, we have a room suited for any dog. At Woodland Park Pet Resort, we believe your pet is entitled to the same caring treatment which he or she receives at home. 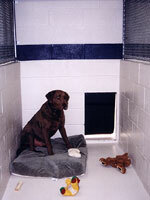 Patio suites are the choice for the spoiled housedog who prefers a room with a private patio. Indoor suites are perfect for the couch potato who would rather stay curled up on his bed in front of the television. 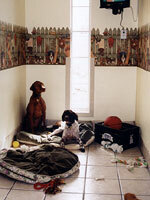 For the more rambunctious guest, indoor - outdoor dog runs might be a better fit. All rooms are climate controlled and are kept fresh and clean all day. Patio Suites were designed with the slightly more active housedog in mind. The interior is finished in residential styling with tile floors, decorated walls, and a glass entry door. The patio is concrete with brick privacy walls between neighboring patios. 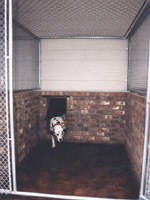 24-hour access to the patio is through a transparent flap-style doggie door. Four trips to the play yard are included each day. Adjoining suites are available. Indoor Suites are great for the dog who requires a little more privacy or who just doesn't have as much interest in the great outdoors. These spacious rooms are also finished in residential styling with tile floors, decorated walls and a galss entry door. Each Indoor Suite is furnished with a color TV and has a full-length window with a pool view. 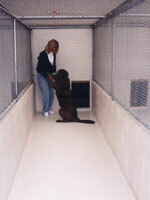 Five trips to the play yard are included each day, including a Bedtime Walk. Adjoining suites are available. Feline guest have their own separate room with cage-free boarding. This room is everything a cat could ever dream of! A cat walk, lots of cozy cubbies and soft beds, scratching posts, and climbing trees will ensure that your feline companion will feel right at home. Two windows overlook the front porch where they can be entertained by the local birds as well as guests coming and going. The third window overlooks the dog grooming room; this provides for a great source of amusement for the cats! Woodland Park Pet Resort, serving the communities of McKinney, Plano, Dallas, Richardson, Frisco, Allen, Fairview, Princeton, Farmersville, Melissa, greater Collin County, and surrounding areas.